On Friday, February 7th, the second annual SF Fauxtest, a fake protest where San Franciscans can air any kind of grievance at all, will be held in Dolores Park. 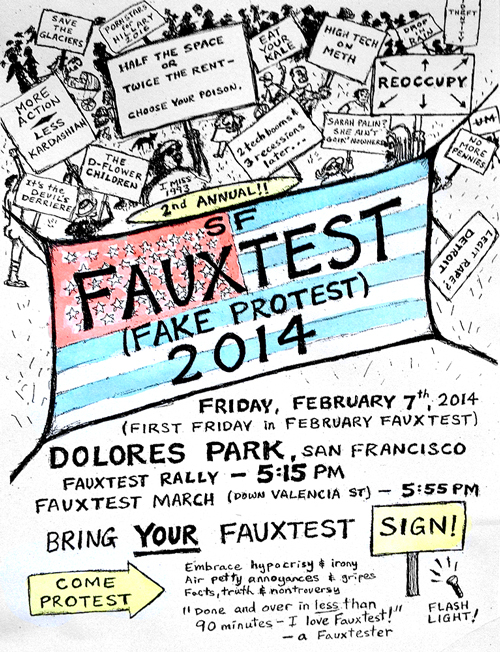 Starting at 5:15PM, the fauxtest will then march down Valencia St. around 5:55PM. Ridiculous signs are encouraged. The first annual SF Fauxtest was held February 1st, 2013.